The power supply is probably the most critical component in your new trading computer. A quality built power supply will be very quiet, cool, and have very stable voltages. Lower cost power supplies tend to have fans that are loud, and often don’t have enough heatsinks to dissipate the heat so they get very hot, the voltages can fluctuate and cause instability with your pc. There are a lot of companies that sell power supplies, but just because there is a label with the companies name stuck to the unit doesn’t mean that company actually manufactured it. There are in reality very few companies that build the units, most companies contract the work out to these few companies and brand them as their own. We feel this is a very important distinction, because the company we have chosen to power all of our computers is SeaSonic. 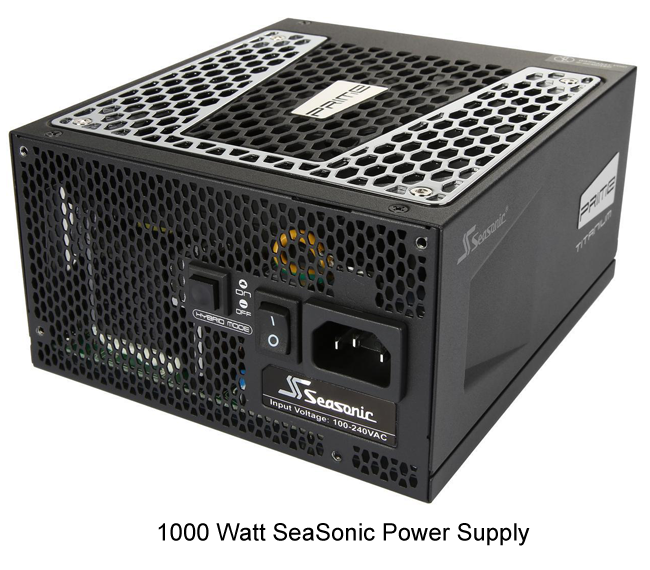 SeaSonic is manufactures their own power supplies, as well as many other units from other companies. SeaSonic is the best manufacturer, their units have very stable voltages and we have very few failures. Honestly, in over 15 years of shipping out trading computers to customers we’ve only had a couple SeaSonic units with any issues, and of those we caught them during testing. We offer 620w, 750w and 1000w units. The main distinction (besides wattage) is modular vs partially modular. Non-modular power supplies have all the cables attached inside to the unit permanently. Semi-modular only has the cpu and motherboard power cables attached permanently, the other cables can be added and plugged in when needed. Fully modular power supplies come with no cables pre-attached, this is the best way to go because there will be less clutter inside the computer resulting in better airflow. If the unit ever does need to be replaced, it’s much easier to disconnect the wires from a modular psu. 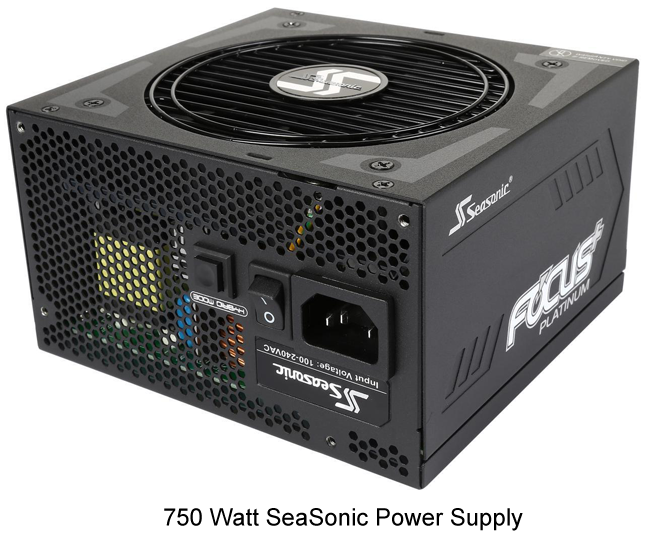 For our gaming systems we usually push customers towards the 750w unit, this will give you plenty of extra wattage for power hungry gaming video cards. 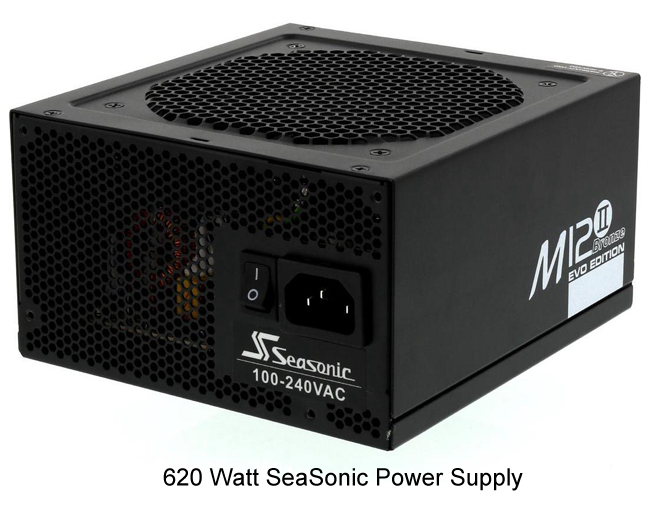 The 620w unit is our go to unit in our trading computers, we’ve installed hundreds of these since 2011 back when we fully switched over to SeaSonic.